Arrest! 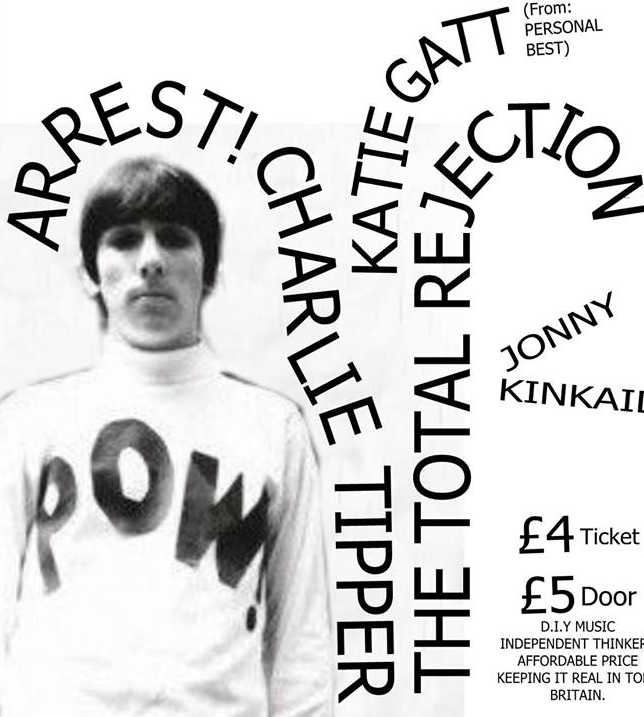 Charlie Tipper + The Total Rejection + Guests! ARREST CHARLIE TIPPER: The band began life as The Charlie Tipper Experiment in 2013, releasing an album and a clutch of singles for Breaking Down Recordings, getting airplay on Radio Two and Six Music for their troubles. In 2015 after releasing a General Election single which had, in all honesty, very little impact on the campaign, they changed their name to The Charlie Tipper Conspiracy because they thought it would be a good idea to keep people guessing as to what they were up to. They recorded a new 10" EP which was released in April 2016 and have since followed this up with a trilogy of 4-track EPs, the last of which is released in June 2017. In 2016 the band performed at the legendary Indietracks festival, and recorded a Christmas Charity single in aid of Refugee Action with the equally legendary Helen McCookerybook, a re-visiting of the Velvet Underground’s Femme Fatale, which Helen first performed with Skat back in 1982. The CTC have a Bristolian pedigree as long as your arm. Lead singer Tim and keyboard player Rocker were both the Flatmates in the late ‘80’s, before Tim joined the Beatnik Filmstars for most of the ‘90s. Guitarist Jon Kent was a founder member of another of Bristol’s C86 squad, the Groove Farm, as well as being the original guitarist for the Filmstars. Geoff played in the respected Harpoons, then later Rorschach and major label outfit Santa Cruz. Cornet player Harry wasn’t even born in 1982 but has since become a major player on the Bristol scene, particularly with his own band The Iceman Furniss Quintet. At the end of the current series of dates 2017 sees the band settle into the studio to record a soundtrack album for a mythical film, “Blizzard”, set for release some time in 2018. THE TOTAL REJECTION: Bristol based band who released Wrapping Yourself In Silver Foil Won't Save You From The Blast is their debut album. They mix the best elements of 60's garage punk, with nods to 60s mod icons such as The Who, Small Faces and The Creation. Added to the musical concoction is a touch of late 60s psychedelia, topped off with a seasoning inspired by the likes of Stereolab and even Lemmy era Hawkwind. Impressive blending of psychedelic grooves with lo-fi garage punk to perfection. Already working on their second album, The Total Rejection are well worth keeping both an eye and ear open for. Most Importantly, The Total Rejection don't want to appear on Later With Jools Holland!